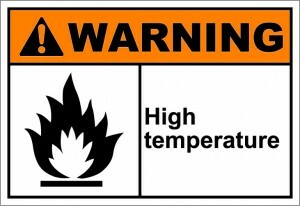 High temperature labels have a wide variety of different benefits that cannot be ignored. For starters, they are available in five convenient sizes for you to choose from depending on the needs of your business. They are also low-outlasting adhesives and come double bagged and vacuum packaged for additional protection during transportation. High temperature labels come in two distinct variations: removable and permanent. Removable cleanroom labels feature EZ-Peel label benefits which are designed to be easily removed form most surfaces when they are no longer needed. Despite that, they can also be reapplied depending on your preferences, which will allow you to use a single label to follow a single product through the entire production process. The fact that they can be removed and reapplied at will makes them ideal for both batch identification and in-process identification. High temperature labels are ideal for identification on a long term basis. Once the label has cured, they feature highly aggressive adhesion. If you want to find out more information about high temperature labels, barcode labels, cleanroom labels or any of the other high quality label products that Tri-State Business Systems has to offer, contact us today. One of our talented and passionate support staff members are ready and waiting to take care of any questions or concerns that you may be having.